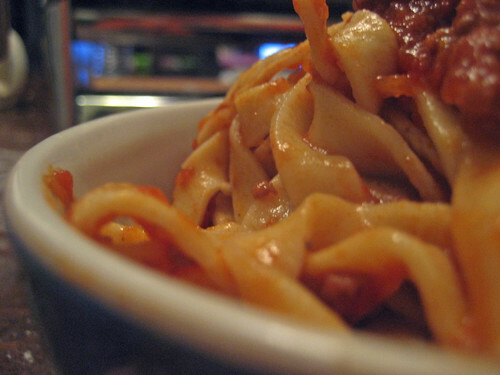 I will never, ever, ever, ever buy dry pasta again (unless its in a tube, i.e. manicotti). Ever! I am fully aware that this is a false promise to myself. A romantic thought brought on by the carb overload, (is it possible to get food drunk?) but if I can help it I will always make fresh. So, where did this affirmation come from? Today (well now it was 2 days ago…) I took a cooking class with Chef Loretta Paganini titled Pasta 101. Talk about amazing! She leaves you not only wanting to be a chef, but Italian as well! Generously, she passed down traditions taught to her by her mother and grandmother to us lucky few today. Oh I love traditions! We made regular pasta, spinach pasta, and chocolate pasta. We then cut them into lasagna squares, bow ties (fun for kids I would imagine), fettuccine, angel hair, cavatelli…you get the idea. We also learned how to make different sauces to go with each type…oh what am I doing working as a pharmacist? I need to be in a kitchen! I felt confident when I left the class and in order to maintain such confidence I knew I had to take a solo flight as soon as possible. 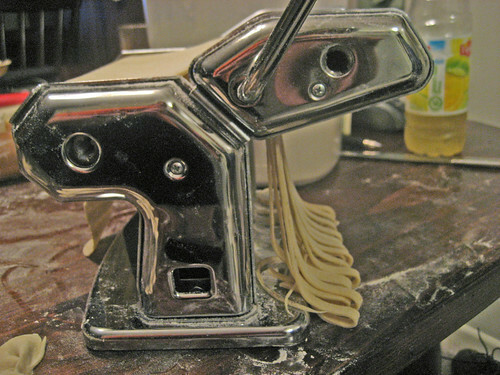 Plus, I want to use my new pasta machine! 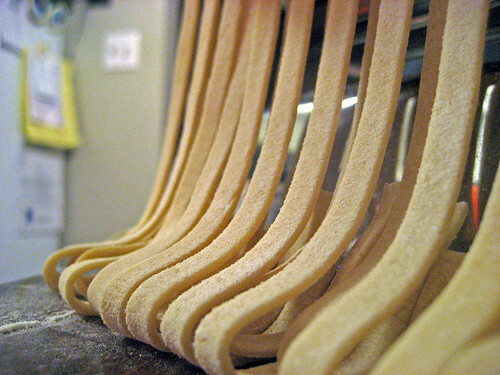 So that is what this post is about…my first solo attempt at fresh pasta. All in all, I think the experience was a success. I made a larger batch than what we made in class, so the kneading needed (sorry for the tongue twister) more elbow grease. It took 10 to 15 minutes of kneading to get final dough. It was great fun and made me feel quite rustic! I do suggest wearing an apron – flour tends to get everywhere! 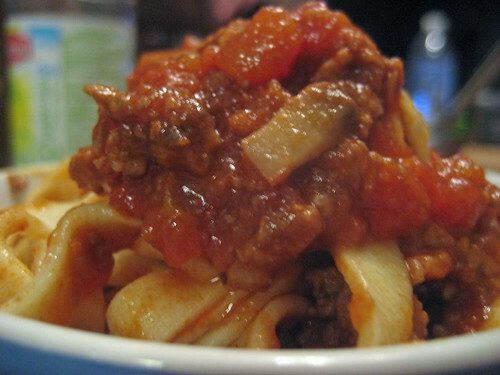 To dress the pasta, I made a bolognese sauce. This recipe will get its own post, but I’ll give ya a sneak peak! 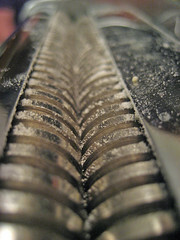 Once cut, can be dried or frozen. Measure out flour onto a flat surface and make a large well in the middle of the pile. 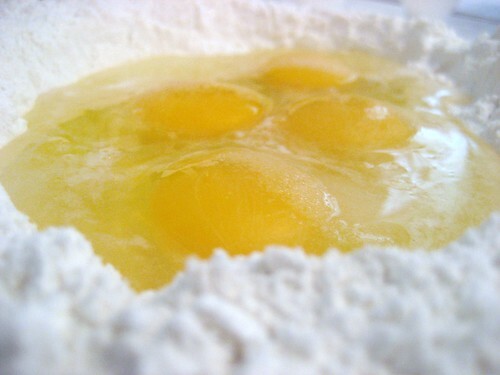 Add cracked eggs, wine, and salt into the flour well. 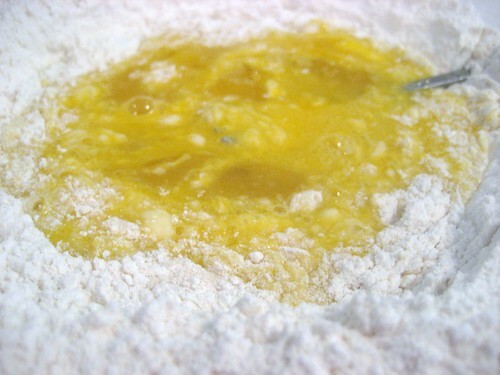 With a fork, break egg yolks and whisk together slowly incorporating flour into the wet ingredients. Continue to incorporate flour until the well can be broken without dry ingredients running out. Put down fork and use hands to continue mixing the flour and wet ingredients until it can be made into a ball ( remember to continue to scrape the work surface)…here you can add a touch more wine if the dough is too dry, or add flour if it is too wet and sticky. Use your best judgement. Once ball has formed, start kneading. Using the heel of your hand, stretch the dough away from your body, then roll it back towards you. You know, knead! I would youtube this if you have no clue how to knead dough. Put your weight into this! It also helps if you stand. This step can take about 10 to 15 minutes. 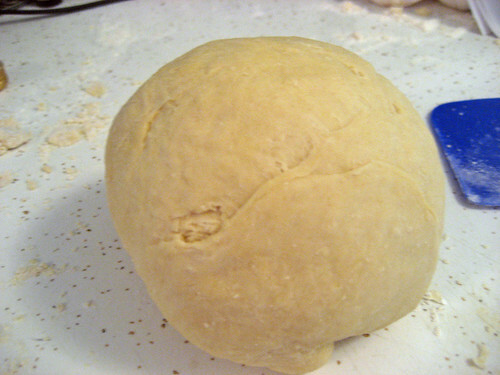 Once the dough is ready it will bounce back when the surface is lightly pressed. Wrap in plastic wrap and let rest for about 30 minutes on counter top before rolling. You can store dough in fridge for 1 to 2 days before using if need be. Flour large surface ( i.e. 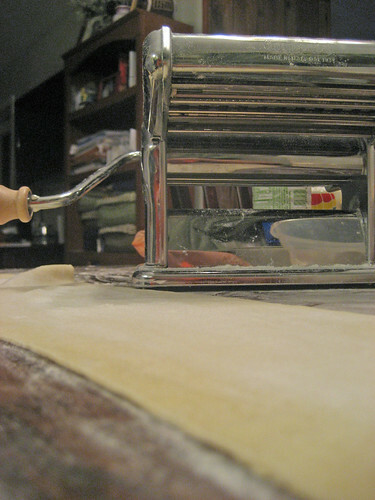 cutting board or counter top) and with rolling pin, roll out dough to width of pasta maker opening. Starting on the largest opening (6 on my machine), feed the dough through the machine. 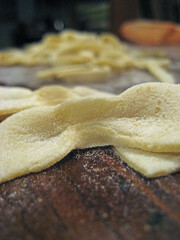 Continue doing this until you have reached setting 1.5 (the thinnest setting makes pasta too thin). Expect pasta to grow in length! 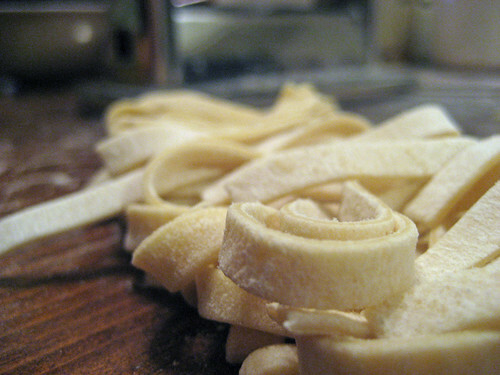 Once the pasta is rolled out, cut into favorite shapes. 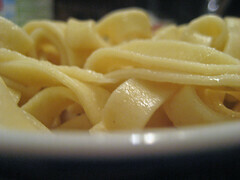 Bring water to boil (about 1.5 gallons per pound of pasta). Once boiling, salt generously – should taste like the ocean! Overall, the pasta had great texture and taste! I think for the first pasta run, it was quite a success. I think the more I do it the quicker I can create…like anything else, practice makes perfect!